Every quilting project is a learning experience. My latest one, an incomplete project, was no exception. I actually wrote about this quilt –my calendar block of the month quilt--last month when I decided to finish it. http://chquilts.ozarkattitude.com/2018/01/pretty-doesnt-need-perfection.html I love doing block of the month (BOM) projects because they tend to keep me interested. Every month is a challenge. Because I started this in 2012, there were some real challenges for me because of some techniques I had never done before. I had never done paper piecing and hadn’t done too many appliques either. This had both. This was the first BOM I ever did. I really enjoyed learning new techniques and practicing the skills I already knew. Piecing was difficult for me back then, as was matching seams and achieving perfect points. To be sure, I did neither in this project, but I did the best I could at the time. Thankfully, I have improved since then. Although I loved making the individual blocks, I wasn’t so enamored with the quilt itself. It was smaller than I would have liked. It never occurred to me to add blocks or borders to increase its size. If I was to do another one like this, I would probably do both of those things. I thought this project had little cohesiveness. I was bothered that it all seemed so helter-skelter. Now that I have finished it, I really like how it turned out. I am no longer “afraid” of all the colors in it. I’m pleased that it has a theme—months of the year-- which really is its cohesiveness. My thinking has evolved since I first looked at all these unrelated blocks. I’ve also grown in my color appreciation. I am no longer turned off by the many colors here. One of the hardest things to do for myself and many other quilters is to decide how to quilt the quilt. I’ve often heard it said, and I now agree, the quilt will tell you how to quilt it. I know how hokey this sounds, but it is true; the quilt will speak to you. For example, I had no idea how I was going to quilt the February block. I knew I wanted the cats to stand out. I was rather fond of this block because I happen to have four cats. So, I used a tiny stipple to make the background dense. I also densely quilted the hearts, so the cats themselves would come forward. One of the cats had a seam that had come loose. So, I decided to quilt an outline around the heart shape, which in turn, would tame that seam. Worked out great. This remains one of my favorite blocks. Another one that gave me fits was the July block. I decided to use a red, white, and blue variegated thread. Big mistake, but I didn’t learn until it was way too late. The blue stars didn’t turn out quite like I wanted them too. The red and white portion of the thread shows up on the blue background, but the blue does not. The problem with the feathers was that the white portion of the thread just looked like an unquilted space. I decided to do what so many quilters tell you to do if you are unhappy with how something turns out. Just throw more thread at it. I did that and they look so much better without the blank spots. I had no idea what to do with those pesky bird houses depicting June. There were no holes for the birds to fly into, so that was the first thing I had to do. I wanted to quilt them all differently, so I looked at the fabric and let it tell me what to do. On the blue/yellow one, I quilted wonky lines, following the fabric grid. I did the same on the yellow roof. In order to add some cohesion to the block, I added diagonal lines for the background. So, all of them look like they belong together, but remain all different. Another place I used the fabric print to guide the quilting was on the jar that is the September block. I’ve been asked what the significance of that is. I assumed the jar was chosen to depict jelly making or canning vegetables from the harvest. My quilt is mine though, so I chose my jar to be filled with bugs. It reminded me of catching lightening bugs when I was a little girl. The fabric has bugs on it. So, I simply drew circles around them, in a form of pebbling. I like how the texture turned out on this block. And that was the approach I took to all of the blocks. I enjoyed thinking through some of these issues. This was the biggest project I have made with free-motion quilting. Everyone says it can be done, so I wanted to prove to myself that I could do it. Normally, I do quilt-as-you-go project, where the quilting is done on each block and they are assembled afterward. This was done traditionally. Truthfully, I didn’t see any real problem with quilting the whole quilt. Oh, it did take a little more muscle to fit the bulk of the fabric in the tiny space, but it wasn’t as bad as I had anticipated. I’m no longer afraid of quilting a large quilt. When I married my husband more than forty years ago, I married into a very talented family of stitchers. His mother crocheted and did a little quilting. But the star of the family was his grandmother, Mary. Everybody just called her Granny. I don’t think I will ever forget her. Granny was a quilter. Well into her 80’s, she would spend her time in the family’s dark, damp basement, lit by only a lone light bulb hanging from the rafters where her quilt frame was set up. It was just outside the fruit cellar and coal bin in the house her husband built. My husband tells me she would be down there for hours at a time. She did all her piecing by hand and turned out some beautiful quilts. As she aged and things became more difficult for her, she purchased quilt kits from places like Lee Wards Creative Crafts, which began in 1947. In the 70’s, it morphed into the modern and well-known Michaels. Years ago though, I remember going to the Lee Wards in Elgin, IL. It was huge. To me it was like a kid’s first trip into Toys R Us. But this was not just a store; it was an immense warehouse, with aisle after aisle filled with every kind of art and craft imaginable. I wasn’t a quilter back then, but I did knit and crochet. Even today, I love yarn almost as much as I love fabric. Get me into a place like that now, I’d have to bring a sleeping bag. Granny died in the early 80’s, but she lives on in our memory and of one of the quilts she gave us. Each of his siblings also has one. Ours was from a kit she liked to make. 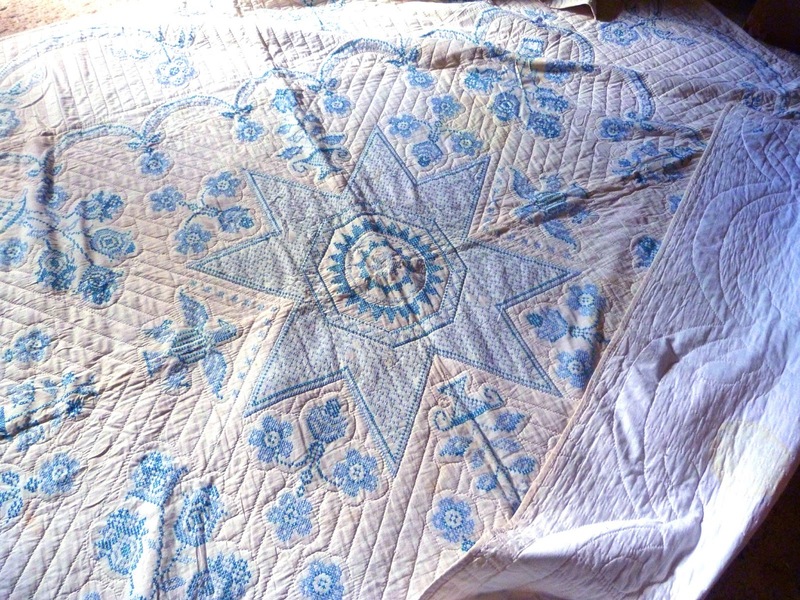 Once she cross-stitched the quilt top, she completed the quilt, hand stitching simple quilting designs. I never actually saw her quilt; I only saw the result of her work. She eventually gave up quilting because she could no longer go down the steep stairs to the basement. She also complained about her failing eyesight. Despite that, she never gave up working on her crewel embroidery. My mother-in-law, who was her caregiver, often bought kits for her. Often times she didn’t care what the finished piece was; she just enjoyed doing the work. The pieces often doubled as Christmas presents. I had never seen anyone do such beautiful hand work. It is hard to believe that her eyesight was failing, given the beautiful stitches she could make. There was never any evidence of it in her work. It was flawless. I recall how she used to sit on the edge of her bed, with her back straight as an arrow and her feet flat on the floor, as the sunlight streamed through her window and onto whatever project she had in her lap. She began sewing after the breakfast dishes were done and worked up until lunch. After the kitchen was clean, she took a nap, and sometimes sewed in the afternoon until the sun went down. I can’t help but think that in the back of my mind, knowing her, planted the seeds of quilting into my own heart, only to sprout a little later in my life.